AR is all the rage at the moment, but what is it? People are talking excitedly about augmented reality right now, especially since Apple gave the platform its enthusiastic backing at the launch of the iPhone X. But what does augmented reality, often abbreviated to AR, actually mean? And how is it different to virtual reality and mixed reality? While virtual reality completely immerses you in a computer-generated world, augmented reality overlays computer-generated images on the real world. This combination of the real world and the imaginary has already proved extremely potent, with Pokémon Go, an AR game where you search for and catch the popular pocket monsters in the real world, becoming one of the most downloaded mobile games of all time. Another popular app that utilizes augmented reality is Snapchat. Rather than using a smartphone’s rear camera, it uses the front-facing camera to add augmented reality effects to your selfies. So, you can add special effects that change your appearance in real time, then send videos or photos with the effects enabled to your friends (or foes). One of the advantages AR has over VR is that you don't need a headset to use it. While VR requires you to be completely shut off from the real world, AR encourages you to remain aware of the world around you. This means AR is more accessible to more people, as the hardware requirements to experience AR are much simpler. What do I need for AR? The good news is that the smartphone you already own, with a screen, camera and compact design, is an ideal device for augmented reality. Thanks to the modern advances in mobile processing power, most smartphones are able to handle impressive 3D animations that bring augmented reality games and experiences to life. As smartphone technology improves, the graphics devices will be able to produce will grow even more impressive – as Apple showed with its new iPhone X handset. So, you’ll need a relatively modern smartphone with a decent camera and high-resolution screen. It'll also need to have an accelerometer, which is a sensor that can detect how you're moving the phone, and which enables it to add and track computer-generated imagery depending on where you're pointing it; pretty much every smartphone will have this built in. You can also use a tablet as an AR device. These come with similar hardware to smartphones and benefit from having larger screens, so the effects can be more immersive, although it also means they're less portable. Laptops and desktop PCs can also utilize augmented reality via their webcam. Due to their lack of portability and motion sensors, computer AR applications are a bit more limited, but you’ll be able to add digital effects and animations to video calls, for example. While headsets are not required for augmented reality, there are AR headsets available that will directly add AR visuals to your view, of which the best known is Google Glass. This early AR headset overlays text and information onto the world around you. Arguably a bit ahead of its time, Google Glass was held back by underpowered technology and a clunky design, but it proved what AR is capable of. Microsoft’s HoloLens is another AR headset you may have heard of. 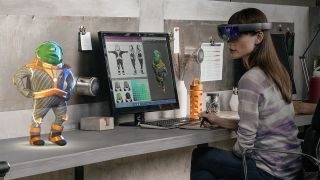 Like Google Glass, HoloLens adds interactive data to your field of vision, and thanks to its beefier specs it can also support 3D models and animation. It’s primarily aimed at enterprise users, hence the high price tag, but a few AR games are being developed for it as well. Perhaps most excitingly for home users, a number of mixed reality headsets such as the Acer Mixed Reality Head-Mounted Display, Dell Visor, Lenovo Explorer and Asus Windows Mixed Reality Headset will be launching on October 17 alongside the Windows 10 Fall Creators Update. Mixed reality (MR) is a combination of virtual reality and augmented reality, and it essentially works in the same way as smartphone AR – using outward-pointing cameras to record the real world, then adding computer-generated text and imagery over the footage. The basic principle of augmented reality, and how it works, is explained in its name. Let’s start with the ‘reality’ part first. Hopefully we don’t sound too much like Morpheus from The Matrix when we say this, but ‘reality’ refers to the world around us. In AR, that reality is most often captured by cameras, then displayed on a screen. The better the camera and screen, the more realistic the reality is. Other forms of AR use mini projectors to overlay computer-generated text and images onto the real world (either directly, or onto clear glass screens). This is a more complex and expensive alternative. The ‘augmented’ part of the name refers to the addition of computer-generated imagery to the reality you see. The CGI objects are created by the CPU and GPU of your AR device. Modern smartphones and tablets now contain hardware that is capable of creating realistic computer images. AR headsets will either have hardware included in them to create the CGI objects, or they'll need to be tethered to a computer (or mobile device) which will do the heavy graphical lifting. Tethered AR headsets are cheaper and smaller, but your movement is limited as they require a constant connection to a separate device. Objects you see in augmented reality can be controlled and interacted with in a variety of ways, such as through voice or motion control, handheld controllers, or by moving the AR device if it has motion sensors. With big names like Apple, Google, Microsoft, Dell and Acer putting their weight behind various forms of augmented reality, we’re likely to see ever more impressive uses of AR in the future.